Re: The Farm Bill aka Agricultural Improvement Act of 2018. Trump signed the bill!!!! This is a very special gift. Thank you POTUS and Congress for the Progress! Here’s our quick brief on the good, the bad, and the ugly as we see it – starting with the bad (6) and working up to the amazeballs of fire (1). 6. The Ugly. Late Tuesday night, the House Rules Committee added a provision to the Farm Bill that would suspend the War Powers Act for the remainder of the 115th Congress with respect to the war in Yemen. 5. Booming Industry. 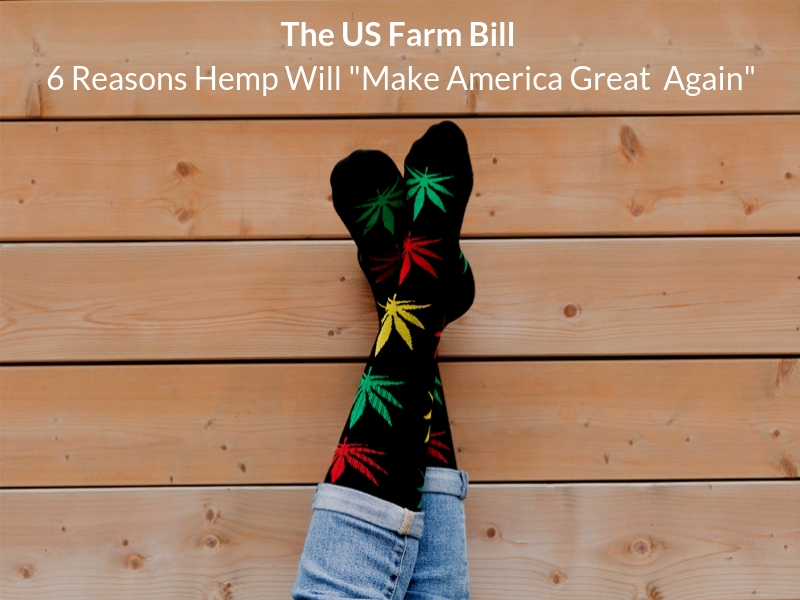 The $867 billion dollar Farm Bill could boost our US hemp industry currently valued at $800 million (Source: CNBC) to reach new heights at $20 billion by 2022 according to Bethany Gomez, Brightfield Group. Farmers are receiving some much-needed subsidies and there’s money for farmers markets as well as research for organic cultivation. 4. Everyone Loves Hemp! Bipartisan support with House approval 386-47 and Senate approval 87-13. 3. US v China with US Positioned to Win. Some of the support from this bill came from farmers who said commodities markets were bearish due to the trade disputes with China. Hemp legalization will of course boost US GDP, create jobs in the US, increase US exports, boost industrial production, and increase retail sales (all stellar! ), but make no mistake that the Chinese hemp market is already thriving according to New Frontier Data. Still with projections of $1.5 billion China and US $20 billion in 2020, hemp could actually “Make America Great Again” to reference Trump’s campaign slogan. In 2017, Chinese hemp sales totaled $1.1 billion (USD), near 1/3 of the $3.1 billion global market, with sales forecasted to grow to $1.5 billion (up 36%) by 2020. Hemp textiles which have long been illegal in the US, accounted for about 3/4 of China’s overall sales of $823 million (USD) in 2017. Chinese sales of hemp-derived CBD accounted for $53 million (USD) in 2017 but is forecasted to expand 4.3x, to $228 million by 2020. 2. Tribal Hemp! Finally. Tribal communities need our support more than ever. As a result of the global genocide on indigenous peoples, tribes in the US are suffering great economic hardship. Jeff Sessions (who is hopefully back to making our holiday cookies where he belongs) rescinded the Wilkinson memo, which previously gave us hope for a future for Native American cannabis. Native lands have been pillaged, suicide rates among tribal teens are heartbreaking, and the US government and Big Oil have been stealing from Indian Country with very little recourse. Tribes have been a voice to safeguard our planet against ecocide atrocities such as fracking, which threatens the very water that brings us life. Hemp can pave the way for some much-needed love and support for those who hold our ancient truths dear. At White Buffalo, we’re proud to say, “We’re ready for this”. We’ve been taking a stand for cannabis and hemp for over 40 years, and we will continue to do so. Join us in this movement and help us to create a better future for humankind the world over.